खगोलीय इकाई (AU या au या a.u. या यद कदा ua) लम्बाई की इकाई है, जो लगभग 150 मिलियन किलोमीटर है और पृथ्वी से सूर्य की दूरी पर आधारित है। इसकी सही सही मान है 149,597,870,691 ± 30 मीटर (लगभग 150 मिलियन किलोमीटर या 93 मिलियन मील). 94 AU: Termination shock between Solar winds/Interstellar winds/Interstellar medium. 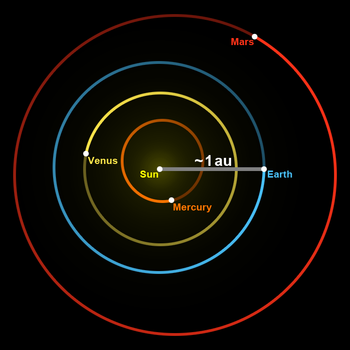 105 AU: As of February 2008, Voyager 1 is the furthest of any human-made objects from the Sun. 500-3000 AU: Beginning of Hills cloud/"Inner Oort Cloud"
20,000 AU: Ending of Hills Cloud/"Inner Oort Cloud", beginning of "Outer Oort Cloud"
100,000 AU: possible farthest estimate of the "Outer Oort Cloud" limits (1.6 ly). 125,000 AU: maximum extent of influence of the Sun's gravitational field (Hill/Roche sphere). beyond this is true interstellar space. This distance is roughly 1.8-2.0 light-years. Proxima Centauri (the nearest star to Earth, excluding our own Sun) is ~268 000 AU away from the Sun.